Coal mining is a common practice in Nigeria, the problem with mining activities here, however, is the negligence of the miners and the government to proper mining practices which makes life difficult for the people. 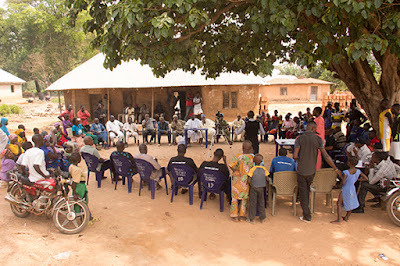 People that constitute these communities where coal mining activities take place, because of their lack or low level of education do not know their environmental obligations under the Minerals and Mining Act and their rights such as right to life, health, adequate standard of living, education, liberty and security etc. Just recently, representatives from the Federal Ministry of Mines and Steel Development, State Ministry of Environment and Natural Resources, media representatives and myself accompanied the civil society group - Global Rights, (a human rights organization who also focuses on issues in mining communities in West Africa) on a study tour to Okobo Community, a small town in Enjema District of Ankpa Local Government Area in Kogi state who has reserves of up to 380 million tonnes of coal. 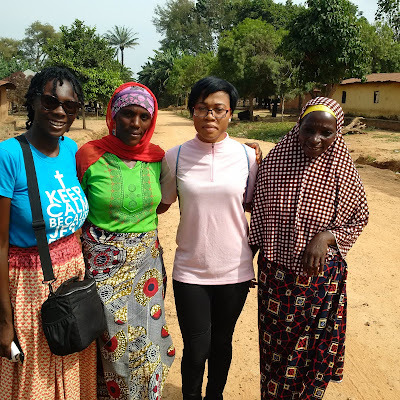 On my arrival and seeing the deplorable state of the community, which is now in worse state than it were when Global Rights team last visited earlier this year (Read up previous posts on coal mining activities in Okobo community here, here and here). Apparently, Okobo is still dealing with both the negative and little or no positive effects of having a coal mining company, the ETA Zuma Group in its community. The Nigerian Mineral and Mining Act of 2007 makes it compulsory for mining companies to seek social license for their activities from their host communities through a “Community Development Agreement” (CDA) with them before mining license is issued. Till date, there are no written evidence of a CDA reached between Zuma Energy and Okobo community. Chief Agenyi pointed out that what existed was an oral agreement and any written form of agreement Eta Zuma presents, was reached and allegedly signed on their behalf by neighboring communities where coal is not mined. 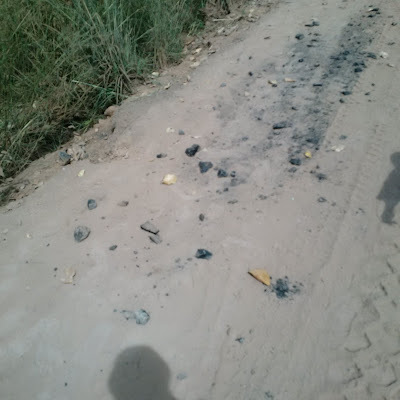 Chief Agenyi said that they had complained on the state of the only access road into their community which can be better described as a dusty road path that raises dust into the atmosphere whenever uncovered truckloads of coal from the mining company leaves the community, littering particles of coal at the side of the road. He also stated that the access road was initially blocked but on getting hint of our possible visit, the mining company hastily patched it up. 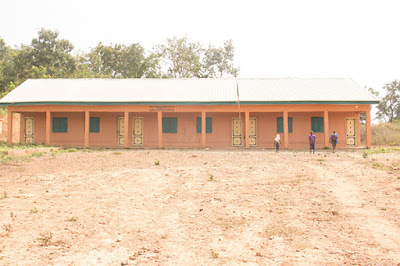 On describing the state of the only school in Okobo community – a three classroom building that combines pupils in primary 1 and 2 in one class, 3 and 4 in one and 5 and 6 in the third classroom is the only tangible development project in the community done by Eta Zuma Group, recently built to compensate for the loss of a child in the community who died from the collapse of the old primary school as a result of the vibrations from the company’s heavy mining equipment. 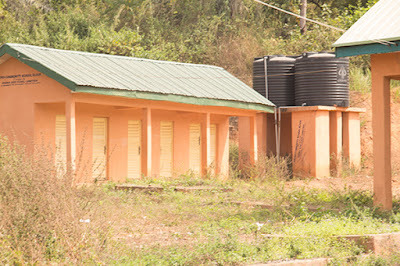 The citizens of Okobo community emphasized that one of their biggest problem is access to clean water. 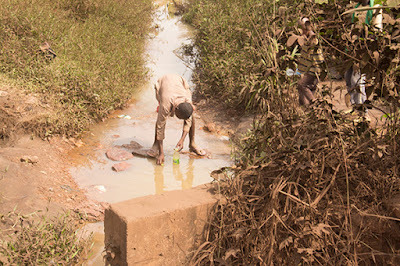 Before the coal mining activities, residents of Okobo were fetching water from the stream that runs through the village. The constant coal mining activities has hugely polluted water from the stream making it unfit for drinking and washing of clothes. It is said that the excavation activities within the 5 meter deep open pit affect the ground water. 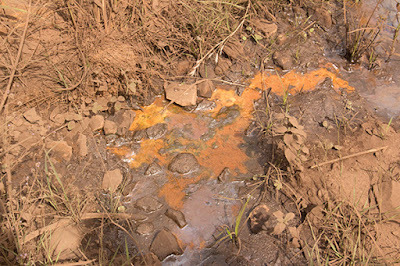 The contaminated residue water make their way back to the community’s stream bearing in mind that the greatest risk mining brings to water sources is Acid Mine Drainage. 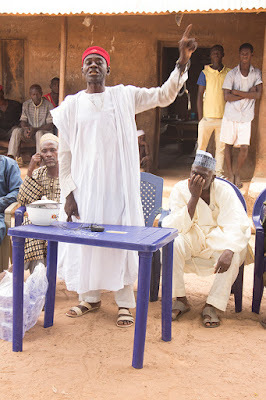 Citizens of Okobo community present at the meeting lamented on how Eta Zuma Group has not kept to their promise on the provision light to the community, borehole installation for clean water, and tarred motorable road network into the community amongst others. The physical borehole recently installed by the mining company, they say has never provided water to their community but stands as a hoax for passerby and environmental activists visiting the community. 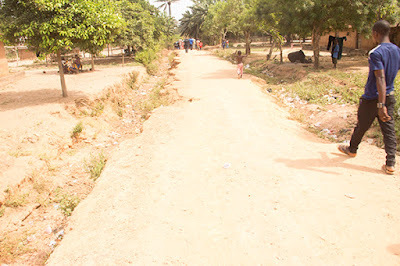 The only untarred road network connecting Okobo to the outside world, constructed by the mining company is mostly used to convey truckloads of coal out of the community, leaving the community covered in coal dust. The dust not only emanate from the movement of these coals but also from the grinding of the coal within Okobo community. The baseline survey carried out by Global Rights team showed high concentration of mercury in the coal dust which affects the nervous system and lung disease characterized by permanent narrowing of airways. 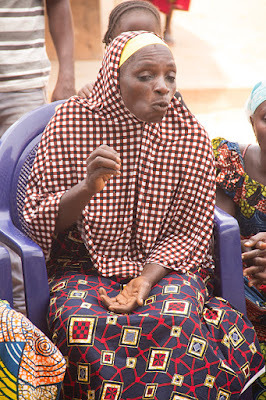 Okobo poverty state has worsened as women from the community cried out that there are no jobs, food, and no means of engaging the people and few of their youths employed by Eta Zuma are banned from joining the community in speaking out against the harsh treatment meted on them. No rain so they no longer farm, their economic trees such as kola nut, cashew nuts, ogbono, palm trees are allegedly harvested and sold by miners residing in the community. No drinkable water, so the women of Okobo travel far to buy pure water to drink and sell as a source of livelihood. Most of them cannot sleep in their homes because of the loud unbearable noise from the mining equipment and also for safety as they claim their lives are being threatened. The community is gradually going into extinction as a result of land excavation from coal mining activities and erosion caused by annual heavy rainfalls. 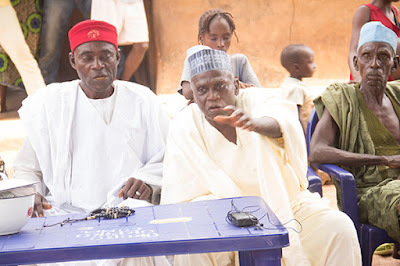 These and more happenings has left the only advocate and spokesman of the community, Idris Ibrahim in a bad condition. Shot in the eye and cut with a machete on his way back to Okobo. He is currently receiving treatment in a hospital and investigations are ongoing to fish out people behind his attack. Speaking with Okobo traditional ruler - His Royal Highness Onu Enjema asked well-meaning Nigerians to help by joining their voices with Global Rights to amplify their small voice and bring the government closer to them which they strongly believe will lead to a tangible positive change to their current state. 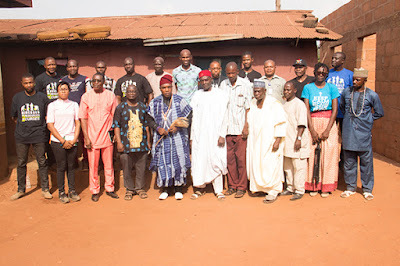 He also emphasized on promises not fulfilled by the mining company and his readiness to work with the company on a legal, communicative level of understanding through a proper community development agreement signed by them and not on behalf of them. 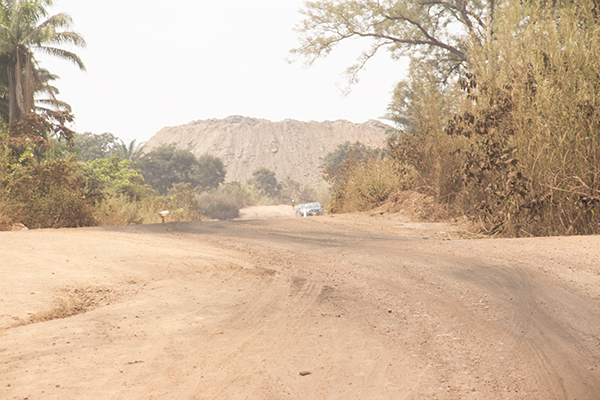 You may not come from Okobo community in Kogi state but similar poor mining activities are going on across states in Nigeria and its exploitation results in environmental degradation with large scale consequences. Although mining activities directly affects a relatively limited area of terrestrial land, its impacts on the environment, as well as on public health, may be found at greater distances from the source and for a long period. Adherence to best practices in mining is a vital tool for the promotion of sustainable growth.